Group of very sharp tetrahedral Helvine-Danalite crystals with a dark brown color and reddish shades. The group is on matrix, with Calcite and Chlorite. The crystals have zonal growths, so, we have done an external an internal analysis, the external one showing Danalite and the internal Helvine. We’ll send a copy of both analysis to the buyer. We specially note that Danalite, the iron rich member of the series, is very uncommon, being very rare on the samples where it is present. 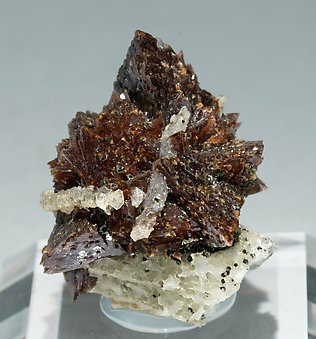 Group of very sharp tetrahedral Helvine-Danalite crystals with a dark brown color and reddish shades. The group is on matrix, with Calcite and Chlorite. The crystals have zonal growths, so we have done an external and an internal analysis, the external one showing Danalite and the internal Helvine. We’ll send a copy of both analysis to the buyer. 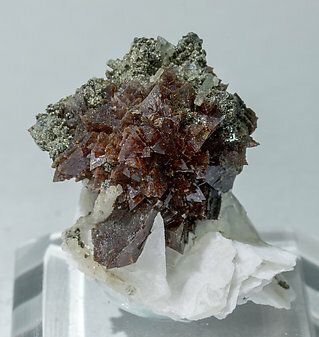 We specially note that Danalite, the iron rich member of the series, is very uncommon, being very rare on the samples where it is present.